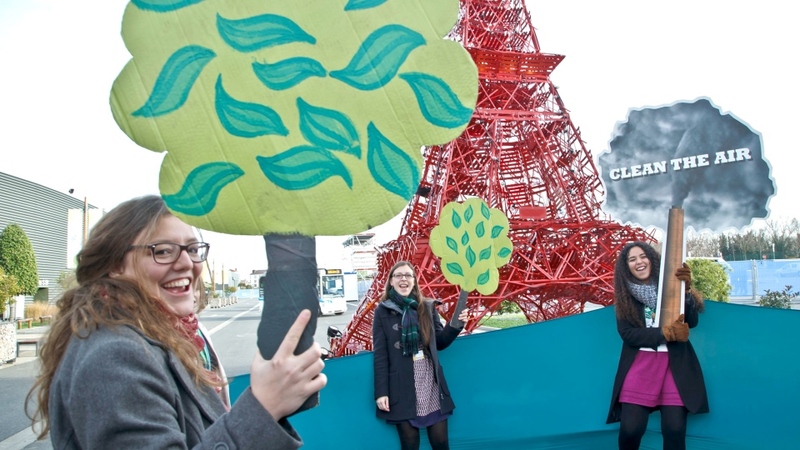 LE BOURGET, France -- Negotiators adopted a draft climate agreement Saturday that was cluttered with brackets and competing options, leaving ministers with the job of untangling key sticking points in what is envisioned to become a lasting, universal pact to fight global warming. As the U.N. talks outside Paris reached their midway point, the 48-page draft agreement was sent along to environment and foreign ministers who will work on it next week. "So let's work," French President Francois Hollande said in a speech Saturday. "It's up to the ministers and officials of every government to remove options, find compromises and make decisions on the difficult issues without undermining the ambition" of the climate pact. Many disagreements remain, almost all related to defining the obligations and expectations of rich and poor countries, as well as those who don't fit neatly into either category. The draft had multiple options on that issue -- everything from who should pay for a global transition to clean energy to what happens to countries that miss their targets to fight climate change. One of the most radical proposals called for an "international tribunal of climate justice" to deal with wealthy countries that don't fulfil their commitments. Rich nations are certain to reject that idea. "We would have wished to be further along than we are at this point, but the text being forwarded so far reflects our key priorities," said Maldives delegate Thoriq Ibrahim, who chairs an alliance of small island nations on the front lines of climate change. Although 184 countries have already submitted national plans to reduce climate-warming greenhouse gas emissions, how to anchor those pledges in a legally binding deal remains to be worked out. Chief Chinese negotiator Su Wei told reporters Saturday that "all the provisions, starting from the preamble to the final clauses, would be legally binding." That contrasts with the U.S. position, which is for some parts to be legally binding, but not countries' pledges to limit the greenhouse gas emissions. Binding emissions cuts would likely require the Obama administration to send the deal to the Republican-controlled Congress, where it would likely be struck down. After the news conference, Su indicated the issue was still up for negotiation. "We have to further discuss ... try to find some proper solution," he said. Jake Schmidt of the Natural Resource Defence Council, a New York-based environmental group, said the issue could be resolved by avoiding words like "shall" in key paragraphs about emissions targets. The Paris accord is meant to be a turning point in the world's efforts to fight climate change. Since they started in 1992, the U.N. talks have not been able to stop the rise in emissions, mostly from the burning of fossil fuels, blamed for warming the planet. Previous agreements only required rich countries to reduce their emissions. The new agreement would apply to all countries, but many developing nations are resisting language that would indicate a shift in responsibilities. The U.S. and other developed countries have traditionally been the only ones expected to provide financing to help poor countries deal with rising seas and other impacts of climate change. They want the new agreement to expand the donor base to include the most advanced developing countries. But major developing countries including India and China are pushing back, amid worries that wealthy countries are trying to dodge their responsibilities. The developing bloc says the parts of world that industrialized first -- the U.S., Canada, Europe, Japan, Australia and New Zealand -- have a historical duty to address climate change. "There is an obligation on the part of the developed nations to provide finance and there is an entitlement on part of developing nations to receive funds for climate action," Indian negotiator Susheel Kumar said. "We don't want dilution of that paradigm."